MET is a direct technique in which the therapist utilizes the muscle barrier concept to position the patient’s body at their restrictive barriers. A gentle isometric contraction is used by the patient to normalize the joint dysfunction. 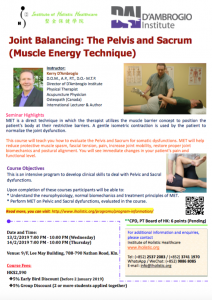 This course will teach you how to evaluate the Pelvis and Sacrum for somatic dysfunctions. MET will help reduce protective muscle spasm, fascial tension, pain, increase joint mobility, restore proper joint biomechanics and postural alignment. You will see immediate changes in your patient’s pain and functional level. This is an intensive program to develop clinical skills to deal with Pelvic and Sacral dysfunctions. 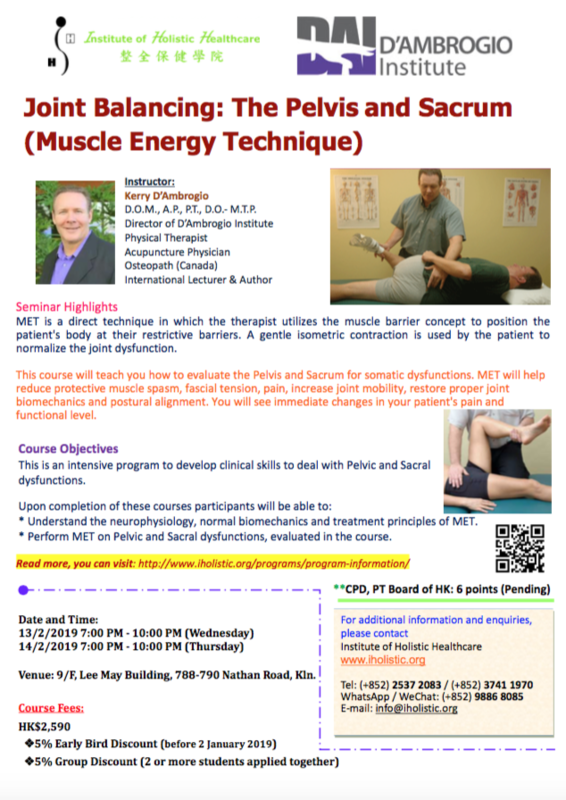 * Understand the neurophysiology, normal biomechanics and treatment principles of MET. * Perform MET on Pelvic and Sacral dysfunctions, evaluated in the course.